Gone are the days of newspaper and radio advertisements as the driving forces behind foot traffic. Customers are no longer impressed with just a friendly salesperson’s greeting without the accompaniment of technology and innovation in-store. In fact, “64% of people think that customer experience is more important than price in their choice of a brand” (nchannel). Today’s consumers are fast-paced, tech driven and diligent online researchers. You can be sure that most of your customers have already checked out your website and competitors’ prices before stepping foot in your store. Have you thought of innovative ways to enhance your business strategies to improve your customer experience? We highlight 3 ways we can help you reinvent your retail approach. Sell smartly – This generation’s shoppers are all about the experience. When they walk into your store, they want to be able to imagine your products in their home. They expect to be greeted by a salesperson fully equipped with mobile technology and product knowledge. “Mobile Point of Sale is growing at 9.2% per year” (Capterra). Today’s consumers simply aren’t satisfied with traditional sales techniques. “Consumers are time and again choosing to allocate more of their spend to experience and in many cases, e-commerce driven businesses provide just that: a more intimate conversation, a compelling product, a closeknit community and outstanding service” (Marvin Traub Associates, Retail Consultant). Rethink your selling strategies by incorporating mobile technology, integrated ecommerce and kiosk driven-interaction. 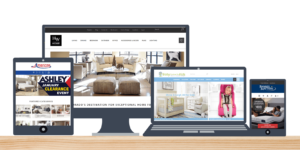 Picture this – a customer does their research on your website and picks out a chair they love. They add it to their online shopping cart, but decide to come into the store to see the fabric in person. Upon arrival, you are able to pull up that customer’s shopping cart on your in-store kiosk so you can discuss the sale together. After seeing the chair, the customer decides they still love it, but wants to discuss the final decision with their family, so they go home to think it over. That night, they are able to again pull up their shopping cart on your eCommerce site and purchase that chair. The concept of Unified Commerce is achieved! If you didn’t have this integrated selling solution, you may have lost that sale; “in fact, two thirds of customers have made a purchase in the last 6 months that involved multiple channels” (nchannel). Merchandise effectively – In the same vein of experience-based decision making, shoppers need to be impressed by your in-store product display. Did you know that 94% of total retail sales are still generated in brick & mortar stores (nchannel)? This means you need to impress your customers as soon as they walk through the door. Do you have attractive vignettes that make the customer feel at home? Do you keep your displays fresh and replace elements weekly? Is your inventory placed strategically based on what has been a best seller? Utilize buying and merchandising reporting to determine which products should shine on your showroom floor. Even further, have you thought about experiential technology as a merchandising element? Virtual and augmented reality in retail are taking off and are projected to make an even bigger revenue impact in the future. “If you want your brand to be considered ‘forward-thinking’ and ‘modern’, you have to consider VR, as over 70% of consumers associated these exact qualities with brands that adopt VR” (Harvard Business Review). Thinking outside the box when it comes to brick and mortar merchandising can give your retail business a competitive advantage. Advertise strategically – As mentioned earlier, traditional advertising alone is a thing of the past. Your organization must keep up with the technological demands of today’s shopper. Digital advertising, social media and online brand presence should all be considered part of your overall marketing strategy. “25% of U.S. consumers will consult social media before buying a gift” (nchannel). 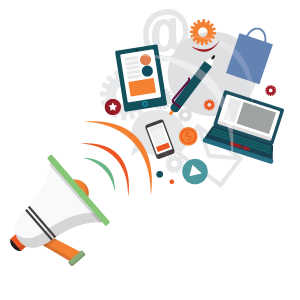 Having a positive presence across all channels will not only help drive sales, but build and maintain brand awareness. This is not to say traditional marketing cannot also help your retail strategy, especially within a certain customer demographic. The key is to advertise smartly. Chances are you have a wide customer base with a variety of different styles. So, why would you market to all of them the same way? Having customer history and product information can help you to determine what your clients have bought in the past, making it easier to advertise to them in the future. Drill down into customer information to create targeted marketing lists. When your customer receives a piece of advertising that is tailored to their taste, they will be more inspired to buy. If the customer experience is positive, you can even ask them to submit an online review, which will only add another dimension to your advertising efforts. “55% of shoppers say that online reviews influence their buying decision” (nchannel). It’s no secret that today’s shoppers have different expectations than those that existed decades, or even just a few years ago. This means that your retail strategy can’t look the same as it did when you first opened your doors. Having an evolving approach to retail will help you to stay on par, and even ahead, of the competition. If you utilize inventive and forward-thinking ideas, you will impress your customer base and inspire them to return.